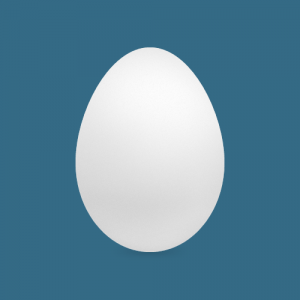 Replace that egg with a head shot, or even your company logo, today! How does anyone know if they want to follow and engage you on Twitter if they don’t know what you’re all about? That’s the purpose of providing a short description just below your name (you know, right next to that profile Egg you’re sporting). Be sure to include a link to your website or blog. A lot of people will click through to learn more about who you are. Part of the idea behind using Twitter effectively is to build an audience of “Followers” who’ve opted in to hearing what you’ve got to say, Tweet, or share. Think of Followers as if they were subscribers to your email list. You probably wouldn’t spend much time on (or get much benefit from) email marketing if you only had 5 people subscribed to your email list. The same goes for Twitter. 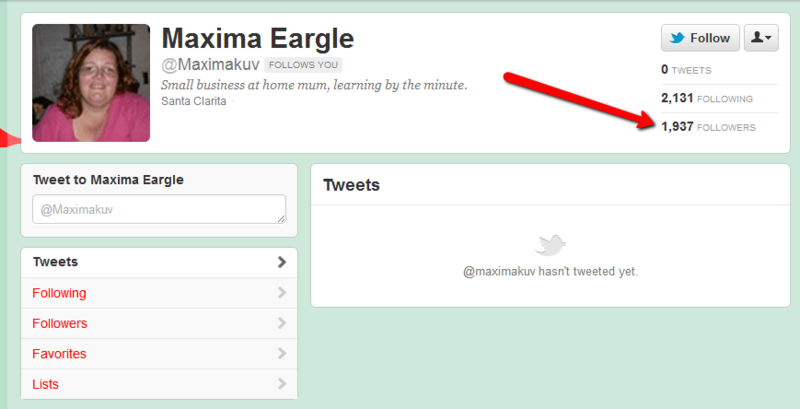 You won’t get much value out of sharing and tweeting if you only have a handful of followers. And while you can find a million-and-one strategies for building a following on Twitter, the easiest way to get started is to simply start following other people. Once you follow some folks, the power of reciprocation and the law of averages kick in. Simply put, there will be people that will automatically follow you back. So you don’t have to put a bunch time into creating or sharing amazing content before starting to build your audience. In fact, here’s a screenshot (image below) of someone that has managed to generate 1,937 Followers and has never sent a single tweet! Seems to me that a good percentage of those 2,100+ people she followed simply (and some would say blindly) followed her back. If you haven’t used Twitter much and are still wary about the whole social media thing, you don’t need to jump head first into the deep end. Just dip your foot and maybe share or Tweet something once or twice each week. It won’t take more than 90 seconds of your time. You read stuff online right? If you read something that you think your customers, prospects, or colleagues would benefit from reading as well, share it. It’s that simple … just share some useful stuff online. You’ll figure out what, when, and how often down the road. But for now, just dip your foot and tweet a couple of things each week. FF – Stands for Follow Friday which is essentially a recommendation. It is used to call attention to a user’s favorite followers and favorite people on Twitter. When you tweet a FF message, you are recommending that your followers also check out the people you mention in your post. # – Hashtags are used as a way of organizing your updates for Twitter search or to tie together all tweets on a particular subject. Hashtags are often used in conjunction with events so you can easily search and see what everyone is saying about that event like #SageSummit. Hashtags are also used in conjunction with keywords like #ERP or #Cloud software. Note of Caution: Don’t overuse hashtags! For more info, check out How to Use Hashtags on Social Media. @Reply – The @ symbol typically precedes a Twitter user name in order to reference that person or speak directly to them in your tweet. As with anything, you often learn best through experience. So just do it. Should I Share a Blog Post More Than Just Once on Social Media? Enroll in Bufferapp.com (paid version) — best Twitter tool out there. Install Google Chrome extension for Bufferapp. Start sharing from your browser on a timed schedule. Wayne – Agree, Buffer is great and the Chrome extension makes it super easy to add new posts. Sounds like you’re using the paid version … aside from lifting the cap on the number of updates, is there something the paid version offers that you really like? Great article Mark! You’ve definitely hit the right points. When I look for people to connect with on Twitter I typically scan their profile for a bio and a picture. If they pass the “are they human” test then I will take the relationship further. Keep up the great work! Thanks Greg. Your kind words are much appreciated. I, too, do the quick “are they human” test before following (or following back). Part of that process is to also read their bio/description and quickly scan recent tweets. Which is why, in my experience, completing your profile and posting just a few recent tweets is important.